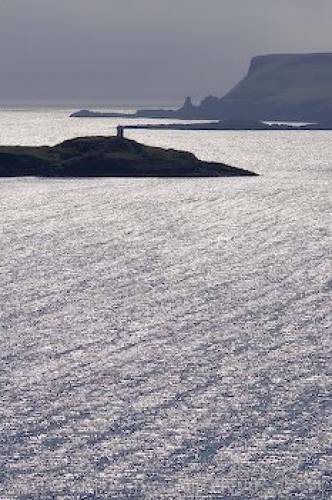 The late afternoon sun turns the water silver between the Hebridean Islands in Scotland, Europe. In the afternoon light the sea between the hebridean islands shines like quicksilver. This light is very common on the Isle of Skye which adds to the mystical attraction this island has. Hebridean Islands in Scotland, Europe.